Are you looking for high-energy ensemble class program introducing little people to the wonders of classical music? Experience a cello only ensemble program that plants musical learning seeds in your child that will help them grow into active little cello learners. Music can develop your child’s confidence, creativity and independence. Drawing on 25 years experience as a music educator and as a mother, Louise King has developed the new Youth Beginner Cello Class Ensemble program to appeal to and engage busy active little minds and fingers. If you are looking for a music class that develops the whole child through learning music – cognitive, physical, emotional, language and musical skills – then you are in the right hands. Youth Beginner Cello Ensemble Class is ideal for kids ages 4-10 in kindy, primary school or home-schooled and kids who think meeting new friends who play cello would be fun. Come and make music in a jam-packed activity class! Using powerful imaginative resources and engaging music games, Cello Dreaming knows how to tap into your child’s creative spirit to develop learning strengths, creativity and musical confidence. Music Games Playful music activities integrated to music literacy, vocal development, listening games, rhythm and games that develop muscular control and body co-ordination. 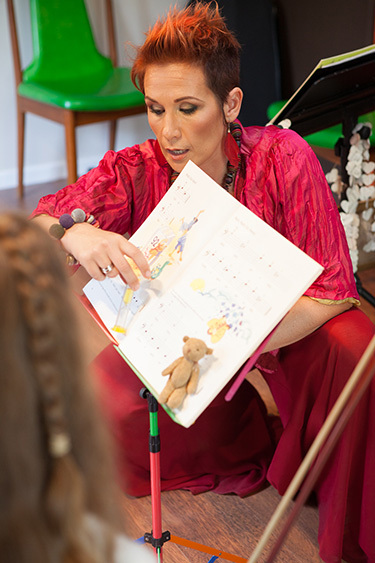 Singing Activities include a mixture of musical styles and well-known songs to allow your child to explore their voice. Singing helps develop your child’s pitch recognition, memory and recall, physical development and sense of well-being. Storytelling and Literacy Each class is built on the concept of a musical story or theme such as Day At The Beach or Dinosaur Stampede. Let your child experience a fully integrated educational experience through the power of music. Parent Involvement Your child is learning to be self-sufficient in a group setting of peers, whilst taking comfort from knowing their parent is close by. Parents or caregivers are welcome to participate in the last 10 minutes of each class so as to support the student with the At-Home Resources ensuring the learning can continue at home with your child’s best teacher—you! 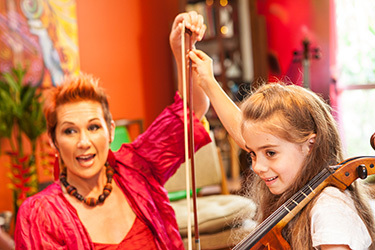 Under the expert guidance of professional musician, educator and mother Louise King, your child will be introduced to the delights of classical music and the fun and excitement of learning how to play the cello. Friends and family have the chance to listen, watch and support your child’s musical development in the annual public concert performance at the end of the school year. “Making learning music fun, social and creative.”. Cello Dreaming recommends that participants have their own 1/8, ¼ or ½ size cello depending on the age of the child participating. Need to look into buying or renting a cello or not sure what size to get? Take a look at this online article “Guide To Buying Your First Cello” or contact Simply For Strings or your preferred local music shop for competitive rental packages. The presenter, performer Cello Dreaming reserves the right of admission to the class program. If a student misses a scheduled class, there is no refund, make-up lesson or rights of exchange for a different class. Perfect for home schooled children or primary school students! Take part in these public student concerts – more opportunities announced through the year. EARLY BIRD DEAL Book online before classes commence. MORE INFO Send an email to info@cellodreaming.com.au or call Louse King on 0415 128 799. Music is provided. A minimum of 4 students per class is needed to ensure the program runs. WHAT TO BRING cello, bow, rosin, end-pin stopper, pencil and eraser, folder for music sheets and your imagination!